In late August 1914 two Skidi Pawnee men appeared in Lincoln, Nebraska. They had been invited to tour Pawneeland with Melvin Gilmore, a scholar at the Nebraska State Historical Society, and Leonard Herron (editor of a weekly newspaper) and his wife. One of the Skidis was an elderly Leader named White Eagle; the other was Charles Knife Chief, a younger man who, unlike White Eagle, had a good grasp of English. This was the deep end of summer, full of hot sunny days. The five travelers set forth into the bright countryside, riding in Herron’s new “five-passenger” Model T, trekking down roads that have since become paved and convenient. White Eagle and Knife Chief murmured in Pawnee, and Knife Chief passed along various comments to Gilmore, who later prepared a memoir of the journey. The party stopped at a farm near Fullerton, Nebraska. Walking out into a field of wheat, White Eagle spoke of a Skidi town that had long ago stood there. He called it “Kitkehak Pako (Ancient Village).” But now it was 1914 and a man named CP Cunningham owned the property, and every spring he plowed the ground and planted crops there. Gilmore’s account of the visit is touching. White Eagle walked over the field and stood on the shore of the Many Wild Potatoes River (now called the Loup River), gazing over flowing waters, and he pointed out into the current. Knife Chief translated his comment: “My father’s house, where I was born, was there.” White Eagle then gestured toward “the higher hills” behind the house and he spoke of a Skidi ritual that had occurred there – the Morning Star Ceremony and the killing of a young captive girl. By 1914 the field had doubtless been plowed many times, erasing traces of slowly disintegrating earthlodge rings and other features. Gilmore wrote that it was “easy to see all over the site and to see all the contour.” But if any fading earthlodge circles were still visible in the wheat or at the riverside, Gilmore made no mention of that in his manuscript. When NSHS archaeologists visited the site in 1940, they found no evident earthlodge rings or other surface features. They surmised that the entire city had eroded into the river. On nearby hilltops they excavated two earthlodge floors attributed to “an Upper Republican Aspect site” dating back some centuries – ancestral to the Pawnees and related communities. And they located what seemed more recent features: two post molds, a burned area, and a few fragments of Pawnee pottery. Thinking of White Eagle’s report of a ritual sacrifice here, they wondered whether they had found evidence of a Morning Star Ceremony. White Eagle died in 1923. He is today revered by many Pawnees as a respected ancestor, a hereditary Skidi Leader. It is also apparent that he spoke to his kin about his 1914 visit to Pawneeland, recalling his pleasure at visiting the vanished Skidi town where he had been born. Garland Blaine was a grandson of White Eagle’s brother, John Box, and he visited the Cunningham site in 1976. There Blaine was given a note that came from the hand of a daughter of CP Cunningham. She recalled how White Eagle had said “that the village on the high bank was his fondest memory.” White Eagle felt moved to find himself gazing back to his earliest memories of Pawneeland, the city where he had been born. Available records pertaining to the birth of White Eagle are extensive and unclear. The earliest record is his Pawnee Scout 1864-1865 enlistment, indicating his birth about 1837. White Eagle traveled to Europe in 1874, and as reported by researcher Dan Jibréus, two advertisements list his age as 23 and 28. But these must be spurious. It does not seem at all likely that White Eagle was born in 1851 or 1846. Pawnee Agency allotment records give his age in 1892 as 56, born about 1836. In an 1895 affidavit White Eagle said he was “60 years of age…” born circa 1835. A 1903 census of Pawnees recorded his birth at “about 1836.” These records from 1864 to 1903 establish his birth at circa 1836. But just a few years later White Eagle settled on an older date of birth. In a 1913 transcript of Pawnee Council Minutes, he said, “I am 82 years old” – circa 1831. The next year at two heirship hearings in June and early August 1914, he testified that he was age 83. Later that same August, Gilmore wrote that White Eagle “is now far advanced in age, being about eighty-five years old.” That would place his birth around 1829. I have seen an undated family tradition (an unsigned typescript dating to the 1970s) asserting that White Eagle was “born in Nebraska about the year 1825.” And drawing on Garland Blaine’s family traditions, Martha Blaine wrote that White Eagle was born in 1831. These records are a little confusing. We can say with certainty that White Eagle was born sometime between 1829 and 1837. It is evident that during the last decade of his life, White Eagle came to believe that he was born about 1831, but records stretching over four decades agree that he was born circa 1836. This can be taken as the most trustworthy date. With this likely date in hand, as well as his account of being born at the Cunningham site, we should look for evidence of a Skidi earthlodge community at that location around 1836. Skimming various records, I can find no hint of such a town. Instead, I get the impression that up to 1842 all the Skidi bands dwelt together in one city known today as the Palmer site. This site can be identified with some confidence as the “Old Town” of Skidi tradition. In April 1835 missionary John Dunbar visited the Skidi city on the Many Wild Potatoes River and he noted, “The Loup village is quite ancient.” This was no doubt a reference to the Skidi name for the city: Kitkahahpakutu, Old Town. In September 1839 Dunbar conducted a survey of Pawnee communities and he prepared a hand-drawn map that showed a single “Loup village” of “64 lodges” on the Many Wild Potatoes River. This was the westernmost Pawnee community, no doubt the Palmer site city. If there was a Skidi Pawnee earthlodge town at the site of the Cunningham farm during the 1830s, we would expect to find some mention of it. As far as I know, the 1914 Gilmore account is the only record of it. Given this circumstance, we must ponder whether some kind of error accounts for White Eagle’s information. I have no idea how the Cunningham farm was selected as a place to visit in 1914. One possibility is that White Eagle gave detailed instructions from memory and the travelers found themselves knocking on CP Cunningham’s door. A news report from a Columbus, Nebraska newspaper seems to indicate that White Eagle was indeed thinking about Old Town when the tour began. But it seems unlikely that White Eagle would have guided Herron and Gilmore to the Cunningham farm. We can guess that Gilmore and Herron selected the site. In 1914 the archaeological study of Pawneeland was in a rudimentary state, but a good number of Pawnee sites were known, and we can suppose that Gilmore and Herron used that information to organize an itinerary for the road trip. Herron was editor of The Nebraska Farmer, and would have been well-known in the countryside, a welcome visitor – and he might have heard of various farms in Nebraska where one could find scattered artifacts. But we don’t know how the Cunningham farm was chosen. We can speculate that when the party stopped at the Cunningham farm, Gilmore told White Eagle and Charles Knife Chief that they were standing at the location of a Skidi town. There is no record that the visitors observed any traces of an old vanishing Pawnee city in the wheat field or at the river’s edge. If nothing could be seen, it would have been reasonable for White Eagle to conclude that the river had washed everything away. Gilmore wrote that the old man “pointed to a place about two hundred feet or more in the stream” as the location of the earthlodge where he was born. In brief, White Eagle thought he was standing at the site of Kitkahahpakutu, Old Town. Studying Gilmore’s record of that day, it does not appear that the group made any visit to the actual location of Old Town at the Palmer site. This was because Gilmore and Herron did not know about the Palmer site. Waldo Wedel in 1936 noted that the Palmer site “was discovered by Mr. A.T. Hill… in 1922, and has been identified by him as the probable site of the Skidi village reported by Major Sibley in 1811…” Hill and his wife drew a map of what they found at Old Town in April 1922. It showed about twenty remnant ruins of earthlodges, with the rest of the city plowed away under wheat. Pawnee oral tradition records the location of Kitkahahpakutu. In a narrative recorded in 1906 by James R. Murie, a Skidi priest named Roaming Scout told a story about the origin of a fraternal society, saying, “This story originated from our people when they had their village at the old village site in Nebraska about fifteen or twenty miles west of Fullerton. Kitkahapahuk, old village; that is where I was born.” The various records of his age indicate that he was born between 1839 and 1846, but the earliest records (and the majority) settle on 1839. This date is consistent with the known Skidi occupation of Old Town at the Palmer site. We know that the Skidi bands left a city at the Palmer site in 1842, and this was called Old Town, and White Eagle was born about 1836 at Old Town. When his family left that city in 1842, he was about age 6 or 7. If all these references really pertain to the Palmer site rather than the Cunningham farm, this means that when White Eagle pictured the city of his birth, he had to summon memories from his boyhood. The evidence is slim for a Skidi town at the Cunningham site. White Eagle did his best to fit his memories into CP Cunningham’s wheat field that day in 1914, but we should feel doubt about what happened. We can guess that had he been taken to the Palmer site, he would have said there what he said at the Cunningham farm, telling of his birth, estimating the location of his father’s house, and reporting on how a Morning Star Ceremony had been held on the ridge overlooking the city. White Eagle was born about 1836 at Old Town on the Many Wild Potatoes River. His father was Kuh-coo-tu and his mother Chay-tah-he-kee-wah-la-wah-hiss. His younger sister (she later in life took the name Julia Troth) was also born at Old Town, just a year or so before the Skidi moved away to build a new city farther down the Many Wild Potatoes River. Two more siblings followed: Red Fox (John Box) and Cho-pee-de-cah. At Old Town White Eagle’s mother had six siblings and his father had two brothers, so they had a lot of close relatives and extended family living in the city. And they were Skidi royalty, priests and leaders and keepers of religious bundles and ceremonies – aristocrats of the Skidi confederacy in Pawneeland. That shaped the social world of White Eagle’s childhood. When the people gathered in their city and in their camps, they told stories. White Eagle used to talk about something his mother had seen – the time at Old Town when the stars fell. That happened in the fall of 1833. And late in his life White Eagle shared with James Murie and George Dorsey some of the stories he had heard in the course of his life. These appeared in collections of Pawnee narratives published in 1904 and 1906. I find one story particularly interesting because it concerns “a little boy” who visited a town where a witch dwelt. That little boy “came to the village” and the witch “sent a challenge to the boy” – a challenge to dive into some nearby waters. The boy agreed and when he dove he “turned into a beaver, and went to the beavers’ den.” At last he emerged, and he shouted with the people and they killed the witch. This was just one account of what happened. Maybe it wasn’t true; other people told a different version. They told of how the witch challenged the boy “to slide with her on the ice.” When he threw himself onto the frozen waters “there stood a big otter.” The magic otter glided on the ice “like an arrow” and the people charged and they killed the witch. Perhaps this is what really happened. I wonder as I read this brief wisp of a story. When White Eagle narrated it long ago, did it hold personal resonations for him? He had long ago lived in a Skidi city in Pawneeland, a fabled metropolis on the shore of the Many Wild Potatoes River, an earthlodge city that slowly faded. There he became a little boy. And he heard the people tell their stories, and when he grew up he treasured those memories. The events of White Eagle’s life… the cities where he dwelt… the stories he heard… our lives always fade, become misty and mostly forgotten. Time plows over the details. But it is almost a century since White Eagle died, and traces of his world still linger in Pawneeland. He has descendants; there are descendants of his brother and one of his sisters. Pausing to think of people who lived long ago, and the stories they told to one another, and the cities they built and abandoned, maybe it isn’t always very easy to sort out what happened. But when we dive into those ancient waters, perhaps the past doesn’t really vanish. Maybe the past helps us to imagine the mysterious ways we keep becoming ourselves until the end of our lives, becoming many unexpected things – even sometimes becoming magical creatures of the unknowable future. The lands that lay beyond the Mountain That Touches the Sky seemed made of a dry kind of green, a distant realm surrounded by receding mountains. I had never visited this part of Colorado. For many years I had peered down along the High Plains, south to where the Mountain stood, wondering. Years ago, studying certain matters of the ancient past, I had decided that my ancestors had once dwelt there in the south, and I wondered what kind of world it might be. I had the thought that someday I would visit. Now I was floating across an arid green world; remote mountains hovered here and there. Along the way I thought of Jack Kerouac’s famous novel, On the Road. He drove here in 1950 and made brief mention of his friend, archaeologist Hal Chase, who was “somewhere off the road in front of a campfire with perhaps a handful of anthropologists[. 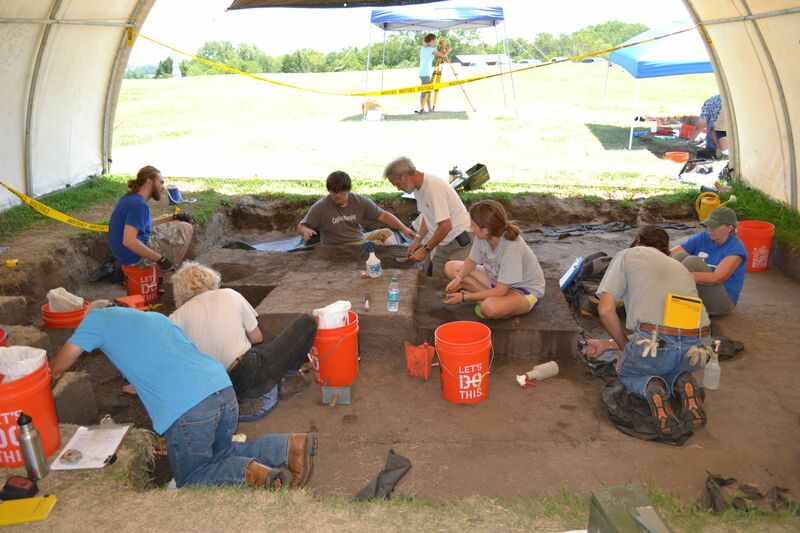 ]” Chase conducted excavations during that time at the Snake Blakeslee site, an Apishapa phase community. About 800 years ago the realm of the Apishapa phase unfolded south of the Mountain That Touches the Sky, stretching down into northern New Mexico. It was probably sometime in the 15th century that the Apishapa phase population moved into the plains, flowing into the folk whose descendants became the Pawnees and other related peoples. I believe we can glimpse memories of this history in certain Pawnee oral traditions. And later generations of Pawnee travelers knew those traditions, and they had come back to this land, journeying in search of trade and treasure and training, stealing horses, stalking enemies, looking for adventure. Turning east onto Highway 64 in New Mexico I skirted the edges of an ancient volcanic field. I was soon driving through millions of years of slowly disintegrating lava flows and fading volcanic cones. Herds of pronghorns and deer stood on the crumbling basalt. Over the next two days I saw various animals galloping over this terrain, and I wondered how they did it, their hooves clattering on stony soils made of sharp corners. I had to walk carefully on the stuff. But all through the years as wind and ice did their magic, the stones slowly melted into rich soils and healthy vegetation. I soon came upon Capulin Volcano National Monument. I stopped my car and got out to look. A lonely mountain capped with a vegetated caldera stood alone north of the road. I took a photo and drove on to the Mandala Center. There I found John Micheal Knife Chief and Walter Echo-Hawk. 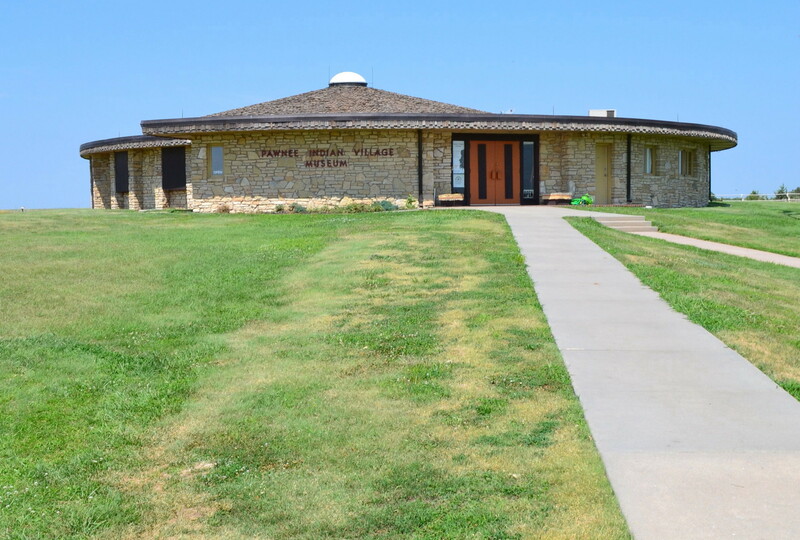 The National Park Service had invited the Pawnee Nation to send a delegation to consult with them about Pawnee connections to the region – John Micheal serves as the Tribal Historic Preservation Officer and he had asked Walter and me to join him. The next morning dawned (May 24, 2016), and we met with NPS staff and two consultants from Parametrix. We spent the morning talking about Pawnee history in the region. Capulin Volcano crouches at the southern edge of the region occupied by the Apishapa phase people. At the northern edge of this realm stands Toos Peh, the Mountain That Touches the Sky. I learned the Pawnee name and its translation from very obscure records provided by a friend, and then I found various traditions that made mention of a place where the earth and sky meet, a place where this world connects to another unseen world. Since some of the stories make reference to the origin of corn agriculture, the stories tend to point to the era of the Apishapa phase. In the course of our visit, the NPS rangers showed us a handful of small mysterious masonry structures. No date could be attached to them, but they do vaguely evoke Apishapa architecture. And at another nearby site someone found a beautifully made side-notched lithic projectile point of a type common in Apishapa sites. A handful of miles to the north of Capulin Volcano can be found a few other sites in New Mexico identified as Apishapa phase occupations. Various versions of a Pawnee migration tradition were set down between 1866 and circa 1970. The stories are brief and vague, but they mention the southwest, the Rio Grande River, New Mexico, and houses made of stone or stone and mud. The people had sacred bundles in that far land, and they had flint knives and flint arrow points. And when they left that land, the journey took them through mountains into the grasslands – the stories mention how their lodge poles left grooves in the stone. This all happened long ago. A match for these glimpses of ancient times can be found in the archaeology of the Apishapa phase. 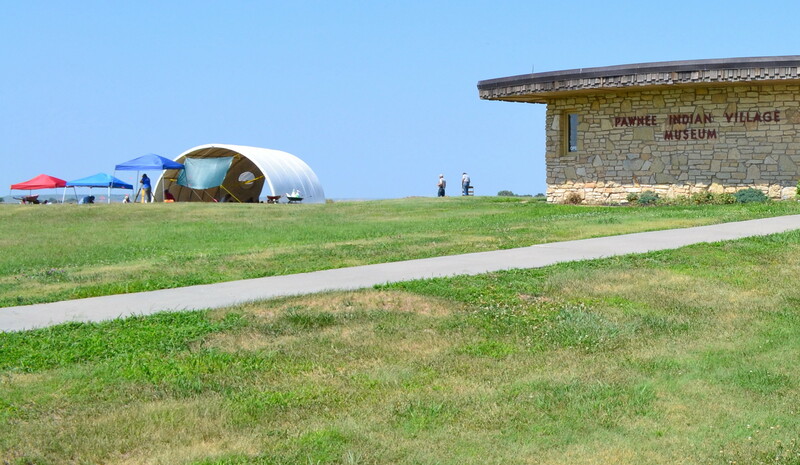 The geography of Pawnee tradition points to the Apishapa occupation area, and Apishapa houses and the houses of Pawnee tradition both utilized stone. These are significant conjunctions. But to see a connection between the oral traditions and the archaeological record, we must be willing to accept that it is possible for historical information to endure over a six hundred year period. It seems logical that this unusual mountain would draw Apishapa visitors. Vague connections between Capulin Volcano and Apishapa are suggested by the stone enclosures and by the side-notched point – it is a type that one report describes as “ubiquitous” in Apishapa sites. Another minor speculative point could also be made. Pawnee tradition recalls how travelers used dog travois transport and there were so many people on the migration that they left grooves in the stone. In the volcanic soils of northern New Mexico travois poles probably did leave visible trackways across well-traveled stony surfaces, and this could have become set in tradition as grooves in stone. High above that vanished world, a paved path encircles the caldera of Capulin Volcano. Our walk was very windy, but the panoramic view from the rim of the volcano was impressive. The evidence for an Apishapa presence here is slight, and yet… there must have been visitors in that time and later. And how can they not have felt a sense of wonder as they stood here on this mountain, absorbing the magic of the southern circles of their world? At the northern edge of the Apishapa homeland we find the majestic ramparts of the Mountain That Touches the Sky – an almost forgotten holy place. That mountain lingers in stories as an old religious site, a place of spiritual symbolism. We do not know of other similar holy places in the ancient southwestern ancestral Pawnee homeland, but the unique visual silhouette of Capulin Volcano stands out. Here at the southern edge of the Apishapa realm, surely this enchanted place meant something to my ancestors long ago. Last Thursday, July 24, I found myself traveling in Pawneeland. 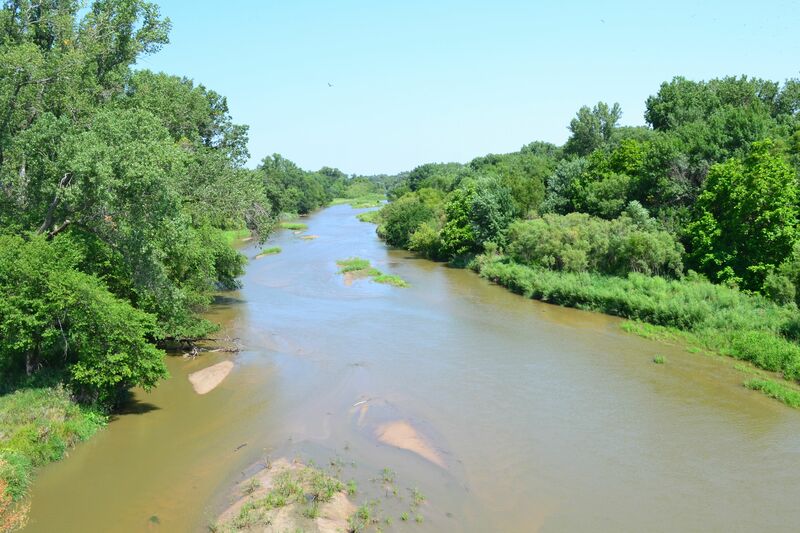 Near Scandia, Kansas I stopped at a bridge overlooking the Dirty Water River (Republican River). A lively flock of swallows kept up a swarming chatter as I took a few photos. I continued on my way among gently rolling ridges, vast cornfields, and tree-lined waterways, and I soon stood before the door of the Pawnee Indian Museum. The museum sits at the edge of a plain, perched above a winding sylvan curve of the Dirty Water River. To the east and north a distant horizon fades into green. Stepping into the museum I met curator Richard Gould. He showed me some newly installed Catlin prints and other exhibits. 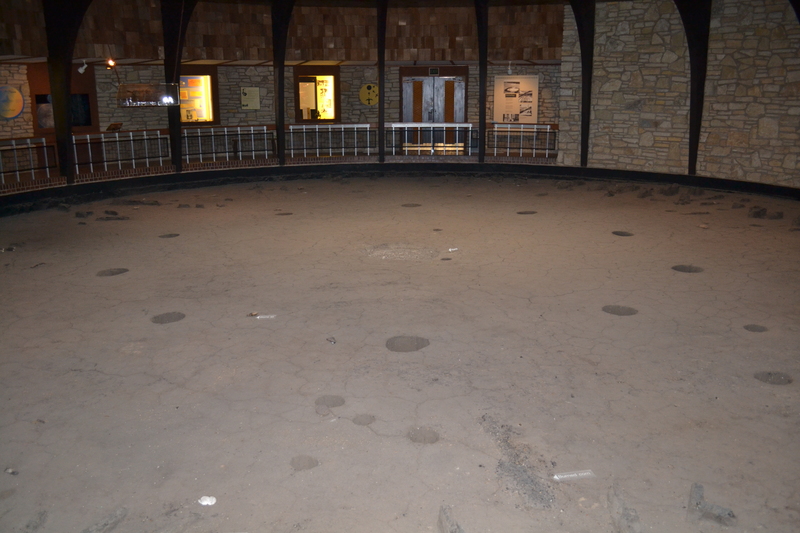 The museum encircles an earthlodge floor excavated by Tom Witty during the 1960s; Tom got the State of Kansas to build the museum around the house floor. 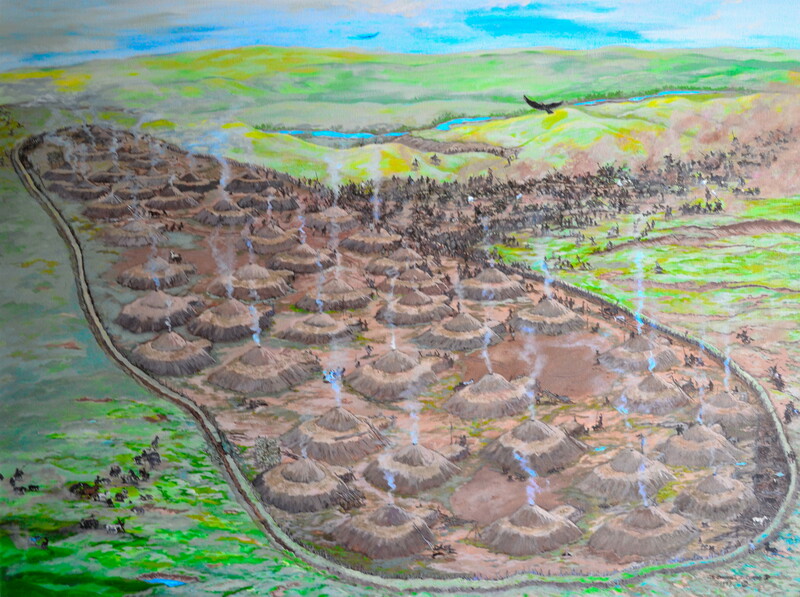 Richard showed me this artist’s rendition of the Pawnee community that once stood here – he pointed out that the earthlodges are not depicted very accurately. This late 18th century city is known today as the Kansas Monument site (14RP1). I don’t know what the Pawnees called the city that once stood here, but one oral tradition speaks of a community at the bend of the Dirty Water River. I think this is that city; so I call it Riverbend City. The Department of Anthropology at the University of Kansas has sponsored several archaeology field schools for students in recent years. This year they invited me to visit, and I found them excavating an earthlodge floor under these tents. The KU field school this year is led by Donna Roper, Jack Hofman, and Mary Adair. 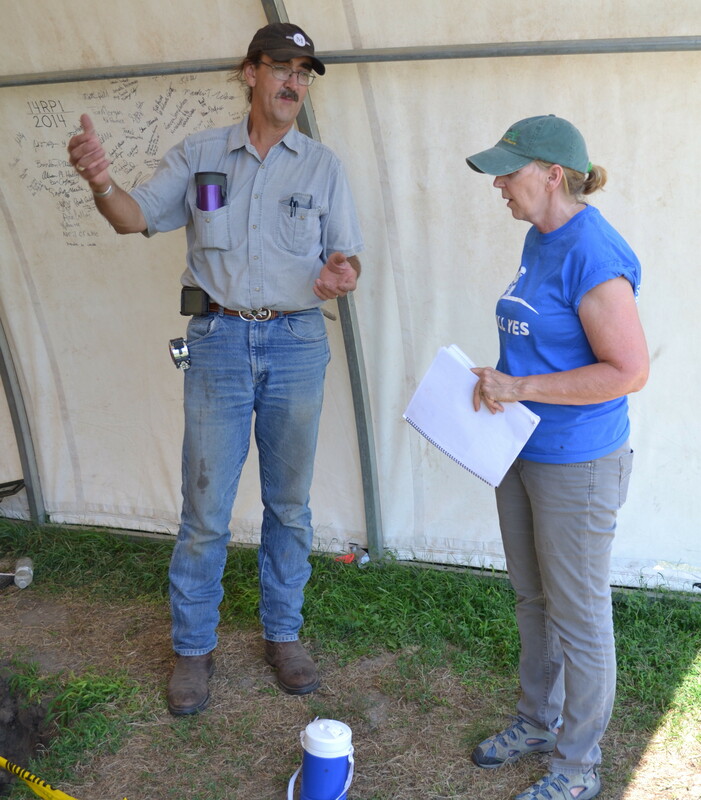 Here Jack and Mary discuss the excavation project. It was a windy afternoon in Pawneeland, sunny and warm. 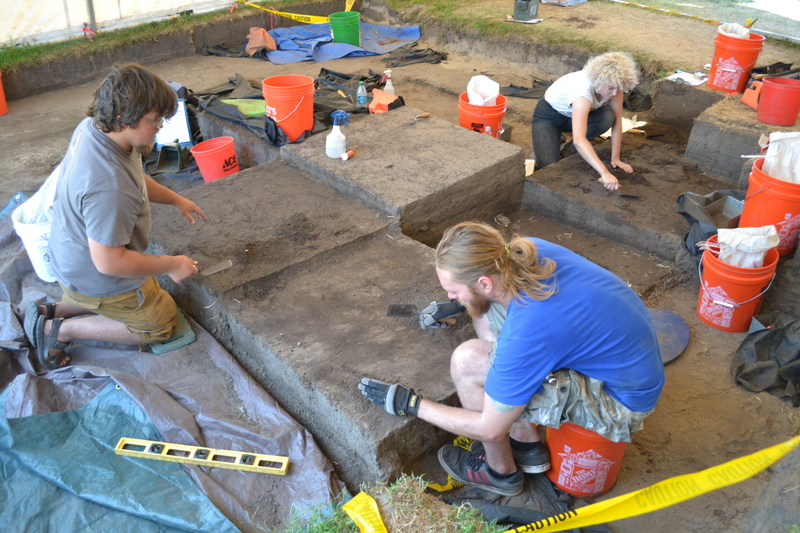 The students carefully remove thin layers of dirt in defined blocks to reveal items in the soil and show patterns of discoloration – postholes and other features. One student, Brendon Asher, showed me a piece of metal found here. It is either copper or bronze. It long ago came to this Pawnee city in the hands of a trader, probably from St. Louis. 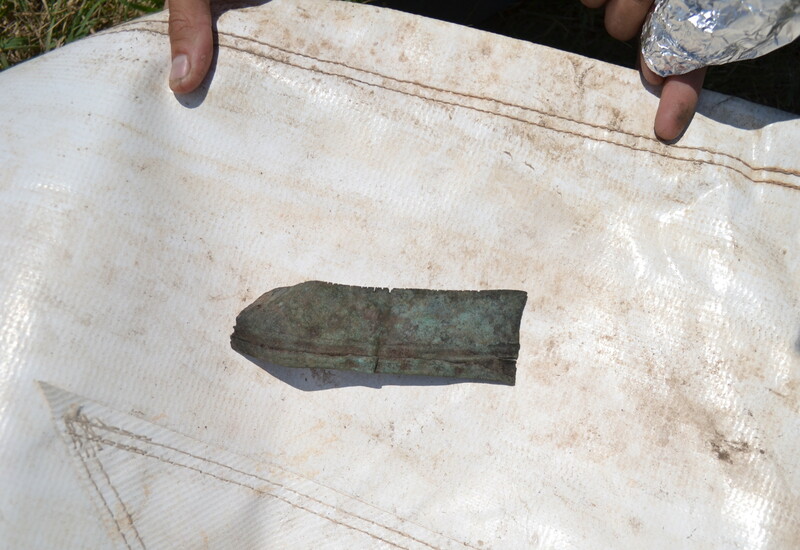 It started out as a metal pot, but the Pawnees refashioned this piece into a serrated knife. In the afternoon I talked to the KU archaeology field school about the history of this site. I believe it was a Little Kitkahahki city. A number of Pawnees today can trace their ancestry back to a man named Sharp and a woman named Ska-wah-hah. They were probably born at Riverbend City during the final years of Pawnee residency here. Their children include ancestors of the Morgan family, Rice family, Curly Chief family, Horse Chief family, Kitkahahki George family, and other Pawnees. It was interesting to walk in this vanished city, to feel the wind and sunlight, and to peer into the earth at the world as it once was, long ago in Pawneeland. I am a writer and artist who lives at the far western edge of the ancient Pawnee homeland, north of the Mountain That Touches the Sky.